David Welsh is Duke Corporate Education’s Regional Managing Director for the northern United States and Canada. He and his team assist clients with strategic business challenges related to global growth, leadership, cultural change and execution. 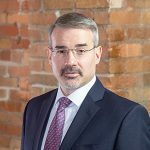 With over 18 years of experience in executive education, David has cultivated relationships across the Fortune 500 and consulted with, designed and delivered strategic programing across many industries including finance and banking, healthcare and pharmaceuticals, industrials, defense, consumer products, government agencies and NGOs. Passionate about simplifying the leadership development process, David is known for his ability to quickly decipher his clients’ complexities and challenges and to deploy strategies that deliver value and measured outcomes. He focuses on partnering to create new market opportunities by aligning strategy, leadership and execution to drive performance. Prior to Duke CE, David served in various executive education leadership roles, most recently serving as the founding Executive Director of the Vistex Institute of Executive Learning & Research at Lehigh University. He helped develop new markets and created unique partnerships. He also funded and established new business centers and institutes for global universities including Drexel University, INSEAD, Thunderbird Global School of Management and Lehigh University. David earned his BS and dual Masters; MBA in Investment Management and M.S. in Finance from Drexel University and has a Certificate in Global Human Capital Management from the Wharton School of Business. He is a certified instructor for the Global Mindset Inventory (GMI) and teaches courses on leadership and strategy alignment, delegation and execution, finance, and marketing/innovation. He is a dual American-Irish citizen residing in the New York metro area.